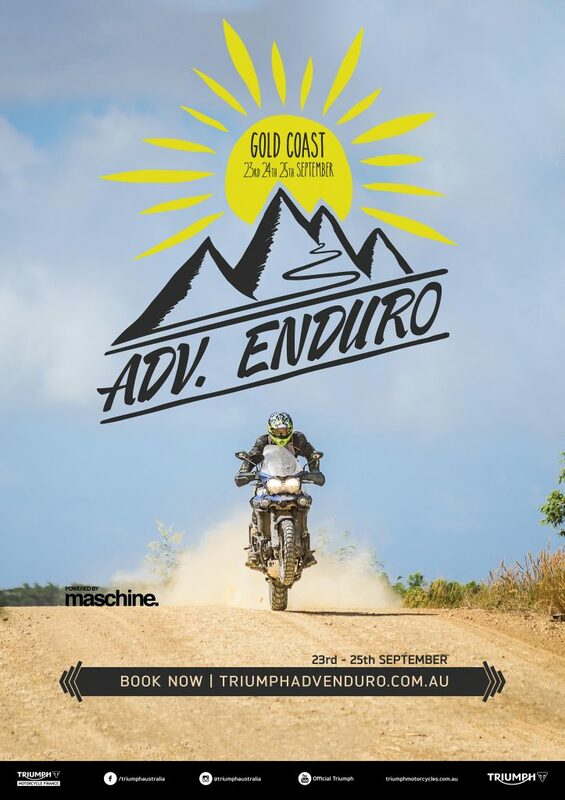 Triumph Australia presents ADV. Enduro Powered by Maschine, a three day adventure ride 23 – 25 September straddling the NSW / QLD border through iconic Australian riding terrain. A range of accommodation and meal options are available from camping to single rooms to suit all budgets. All accommodation and meal packages include 2 x accommodation nights (or camping), 2 x dinners and 3 x breakfasts. Fully supported, including technical and support staff, photo & video production from both Triumph Australia and Maschine – tyres, first aid, technical, sweep and luggage. The distance covered each day will be around 250 – 350km with riding difficulty aimed at the average off-road adventure rider on a multi-cylinder adventure bike. There is lots of great riding along the QLD/NSW border and we will mix it up with some technical off-road sections and scenic twisty bitumen. Perfect terrain for Triumph’s Tiger range. Riders book their own accommodation and Maschine includes 3 x breakfasts and 2 x dinners. Shared accommodation booked for riders by Maschine and 3 x breakfasts and 2 x dinners included. Typically the shared accommodation will be with one other rider and you can nominate to stay with a mate if you are riding together. Single accommodation booked for riders by Maschine and 3 x breakfasts and 2 x dinners included. 3 days of amazing adventure riding trails planned out for you to enjoy. GPS route file to work on Garmin brand GPS. This will include both Routes & Tracks along with waypoints of key landmarks along the route. An event pack containing t-shirt, event ID sticker for bike, luggage tags and printed daily route sheets. Transport of rider’s luggage each day. Technical support from Triumph Motorcycles Australia crew. First aid and communications support from crew. 5 x meals with cooked breakfasts and pub style dinners. Riders will be required to buy their own lunch.